I started my research by examining photographs of the damage to San Francisco and surrounding towns. Imagine my shock when I came across the following picture (Fig 1). It shows the 1906 damage to the very library in which I was sitting some 50 years later! 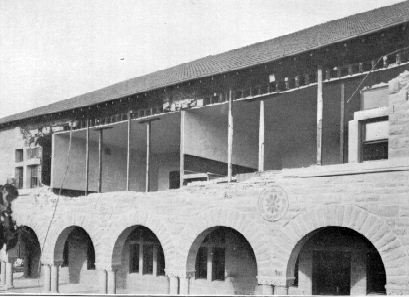 The violent shaking had destroyed 14 buildings at Stanford, killing two students. This reading was examined for its veracity according to the ten evaluative criteria provided in our article, “The Sources and Veracity of Edgar Cayce's Readings – Part 2.” My commentary on the reading's veracity is given below. The reading was given for a 50-year-old male, a Protestant and an accountant. Present at the reading were Gertrude Cayce (conductor), Gladys Davis (stenographer), Estella Smith, Jack Tobin, Jr., and Hugh Lynn Cayce. In trying to apply evaluative factors to the relevant fragment of reading 270-35, I could find no reason to suspect any wavering or shading of the information being transmitted from Cayce's subconscious to his conscious mind. Thus, my summary evaluation for reading 270-35 is that the reading fragment seems to be reliable and without any components of wavered truth. The reading fragment is believed to have true insight into the causes of earthquakes and has predictive capability for the ‘inundations” by earthquakes yet to come. Let's examine each of the several causes of quakes as given in the section of the above reading highlighted in yellow. ….the cosmic activity or influence of other planetary forces and stars and their relationships produce or bring about the activities of the elementals of the earth…. Now we can predict this apocalyptic date to within a couple of years. A remarkable chain of evidence, much of it known for decades but never before linked together, points to 1982 as the year in which the Los Angeles region of the San Andreas fault will be subjected to the most massive earthquake known in the populated regions of the Earth of this century. At the end point of the chain, directly causing this disaster, is a rare alignment of the planets in the Solar System. By disturbing the equilibrium of the Sun, which in turn disturbs the whole Earth, the planets can trigger earthquakes. But there was no massive earthquake in the Los Angeles area in 1982. Why not? Almost everything we forecast for 1982 actually happened -- two years early. Events came to the boil in the second half of 1979, as the Sun's activity rose rapidly toward peak levels. Sticking only with the western seaboard of the United States, the region we concentrated on in our original forecast, three moderate earthquakes in the Transverse Ranges near Los Angeles in 1979 were put in the shade by a pair of jolts that struck near Gilroy, south of the San Francisco Bay area, on Monday, August 7, 1979. The authors then go on, justifying further their two-years-too-soon Jupiter-effect prediction. They cite quakes in 1979 near Livermore, California, and the 1980 Mt. St. Helens volcanic eruption. There is some credible and interesting information in portions of Gribbin and Plagemann's second book. It consists of several examples of historical correlations between earthquakes, volcanic eruptions, and the positions of the planets, the sun, and/or the moon. Could it be that the authors were two years off and an earthquake magnitude or two too short in their predictions of planetary effects because they couldn't take into account the influence of one or more stars? Whether or not gravity waves from stars are behind the reading 270-35's statement about the ‘influence' of stars on earthquakes is about as certain as it would be to say that etheric energy from certain stars will cause earthquakes. Too little is known about either possibility to say anything approaching certainty. We do know, however, that a binary pulsar star was discovered by Taylor and Hulse in 1974 and that measurements of the periodic Doppler shift of the pulsar's radiation prove that its orbit is slowly shrinking. The rate at which the orbit is shrinking is exactly what would be predicted by relativity theory if the energy were being carried off by gravity waves. Two large observatories that use laser interferometry (one in Hanford, Washington and one in Louisiana) are being built to look for gravity waves. Elementals and their activation. Here we will assume that any part of the solid or plastic crust and mantle that can experience earthquakes as a result of planetary and stellar gravitational forces is to be called elemental “earth.” Most all of earthquake seismology concerns itself with the response of the crust and upper mantle only to changes in the internal state of stress or strain in earthy matter. But to say that earthquakes are caused almost entirely by sudden changes in Earth's stress and strain fields is like saying that cigarettes are the leading cause of cancer statistics. The reading, however, is trying to tell us that changing planetary and stellar configurations, that in turn activate new combinations and replacements of earth-matter, gases, heat, and/or fluids, is what is responsible for causing earthquakes. It is, then, primarily the activation by outside forces of the elementals of air (gases), earth (rocks), fire (planetary heat), and water (fluids) that causes earthquakes. Water.Is there a lubricating or other role for water in the deeper rocks of the outer Earth? In 1997, fluid was injected from the surface into the German Continental Deep Drilling Borehole, to a depth of around 28,000 ft. This pressurized fluid induced almost 400 micro-earthquakes at distances up to 2,200 ft. from the borehole. And geoscientists have recently determined that below the surface to a depth of more than 250 miles inside the Earth there may be enough water to replace the surface oceans more than ten times over (New Scientist, 08/30/97). Thus, there's enough water in the crust and upper mantle to play an important role in earthquake generation. Heat.In an earlier article, entitled "Tales From The December 2002 Meeting Of The American Geophysical Union", we have indicated that the Earth must almost constantly be supplied with heat from the innermost core to maintain volcanic activity, motions of plastic mantle rock, and currents in the fluid iron outer core. Simple radioactive decay seems clearly not to be able to have produced sufficient heat over the billions of years of Earth's life. Thus, we agree with the hypothesis that a natural nuclear reactor resides in the innermost core. In any event, various heat sources are available within the Earth and heat from them is constantly trying to escape. Gases. A role for gases in earthquake generation may strike one as a little strange. But this potential function of gas has been vastly underestimated. Consider this sample of the importance of gas along a famous fault in California. New Scientist magazine for 11/22/97 carries an article subtitled, "Gases under incredible pressure could cause California's quakes." The article covers work by a team of geologists at the USGS who show that carbon dioxide, at earthquake-focus depths in the San Andreas Fault, is under such pressure that it could push apart the lithospheric plates on either side of the fault. This would be sufficient to reduce friction and produce earthquakes every century or so. "That timescale means it's possible that this gas could alone be the trigger behind the earthquakes," said geologist Y. Kharaka, USGS team leader. Hydrocarbons are primordial. It is now common knowledge that hydrocarbons were a common constituent of the primordial substances that built the Earth. And spectrographic studies have revealed that carbon is the fourth most abundant element in the universe and our solar system, after hydrogen, helium, and oxygen. In the planets, carbon is found mostly in compounds with hydrogen. These hydrocarbons, at different pressures and temperatures, may be gaseous, liquid, or solid. Our Earth is full of them, from the surface down to the liquid outer core. The Earth was subjected to only a partial melt. Until about 50 years ago scientists thought that our planet had formed as a ball of hot liquid rock. It then cooled slowly and developed a crust. In such an evolutionary environment primordial hydrocarbons would have been destroyed. Its now know that Earth and the inner planets are accretions of solids that condensed from a gaseous planetary disk. The primary condensates contributing to the formation of the Earth ranged in size from small grains to asteroid sized objects. Early on, however, partial melting of the accreted mass took place, as a result of heating by radioactive decay. Melts of higher density sank toward the center of the planet, giving rise at the extreme density point to the natural uranium nuclear reactor proposed by Herndon to lie in the innermost inner core. Low-density partial melts produced the crust. As the cold part of the accreted planet began to heat up due to the heat evolved in chemical reactions (and the heat supplied by the core's nuclear reactor? ), gases started to move outward toward Earth's surface. Stability of the rising hydrocarbons against oxidation, via combining with oxygen resident in silicate and other rock minerals, depends on the details of the outgassing mechanism. If the gases move upward in the regions of magma, this would favor oxidation of the hydrocarbons. It is for this reason that volcanoes emit mostly carbon dioxide rather than methane. When gases move upward through solid rock, however, they first strip out the available oxygen on the surface of the pores and then, over time, will pass through in generally unoxidized form. Hydrocarbons are stable at great depth. It was once thought that temperatures above 600ºC would break apart even the most heat-resistant hydrocarbon, methane. Heavy hydrocarbons were thought to be destroyed at half that temperature. Because such temperatures are generally reached at depths of 10 to 20 miles in the crust, it seemed counterintuitive to expect the occurrence of hydrocarbons from non-biological sources at greater depths. But in publications beginning in 1976, Russian scientists calculated that hydrocarbons could indeed be stable to depths of 185 miles, if not residing in crustal regions warm enough to violate Earth's average temperature gradient. Rock at depth contains pores. Rocks of the same composition become less porous with depth. If connections between pores become too diminished, rocks will provide great resistance to the flow of fluids and gases. At a critical depth limit, where flow is significantly resisted due to compression of rocks, an effective barrier is formed which allows a higher pore pressure to be built up beneath it by fluids under higher pressure coming up from below. In this deeper domain one can expect high rock porosity and permeability. Several levels of barriers, underlain by zones of higher porosity and permeability are believed to be present as one proceeds downward through the mantle. Figure 2 illustrates the concept. Figure 2. Domains of fluid-filled pores in a vertical series of pressure regimes. Low permeability layers (LPLs) retain domains of higher permeability below. Over time, upward migrating fluids may exert enough pressure to breach an LPL, eventually reaching the surface (as gas) and perhaps engendering earthquakes along the way. LPLs and other rocks are fractured by rising fluid, and then ultimately gas, pressures in the uppermost mantle and crust. These changes in the earth will come to pass, for the time and times and half times are at an end and there begin these periods for the readjustments. Hydrocarbons are still upwelling. This final assumption is required for acceptance of the non-biological (“abiogenic”) hypothesis of the origin of petroleum, and along with it, the important role of upwelling fluids and gases as a cause of earthquakes and volcanic eruptions. A hydrocarbon source must still be present at great depth in the Earth. Gold resorts to the use of chemical data to prove that the hydrocarbon source exists. He also presents empirical information from the results of deep drilling in an igneous-rock geological province where, according to conventional theory, hydrocarbons simply cannot exist. Then, almost as an aside to his quantitative presentation, Gold inserts a chapter in which he analyses subjective reports of fluids and gases exuded prior to and during large earthquakes. We turn to this subject area next. Ancient eyewitness reports are no different from those of today. These are the natural phenomena of interest observed in the vicinity of the epicenters of earthquakes: fountains of water and mud, sand blows, asphyxiation, odors, noises, lightning, lights, and flames. San Francisco earthquake of April 18, 1906 (just after 5:00 a.m.): Some 81 reports of sounds heard in connection with the quake were catalogued on pp. 377-380 of the Carnegie Institution report on the disaster. (Refer to footnote 1). Of these, 40 reported having heard sounds before having felt the shock, and 19 reported hearing unusual sounds at the time of the earthquake, without further specification. The observations were “fairly well distributed over the region affected by the shock.” This interested the compilers of the report. They note, “Seismic waves traverse the earth's crust very much more swiftly than sound-waves do the air, so that it is a physical impossibility for sound-waves generated in the air above the seat of disturbance to outreach them.” They wouldn't have been puzzled about this had they known about massive releases of gases that can precede earthquakes. Here is a report from a watchman in Santa Rosa, a town that bore the brunt of the quake. Most of the remaining 40 reports of sounds that preceded the quake mentioned roaring sounds. New Madrid earthquakes of 1811-1812. These earthquakes constituted one of the greatest natural disasters to strikeNorth America. Some of the relevant earthquake effects mentioned in the Annual Report of the Smithsonian Institution are belching forth of muddy water, blue clay, coal, and sand as well as “explosions of the earth “and swamp water temperatures over 100ºF. Most telling is the conclusion that “the face of the country was changed by the terrific explosions.” And in two of the letters odors were described when the first quake hit on December 16, 1811. In Eliza Bryan's letter one reads of a “complete saturation of the atmosphere by sulpherous vapor, causing total darkness.” Anonymous, in a letter to the Lexington Reporter says much the same. Evidence of gas emissions prior to earthquakes is relatively well known. Animals seem to react to low odor levels just before quakes by behaving strangely. Air and groundwater temperatures may rise as well. This was used to predict an M 7.3 quake in the Hai-cheng region of northeastern China in 1975. The local meteorological station that in the weeks preceding the earthquake the air temperature in the vicinity of the Hai-cheng fault was higher than in the surrounding region. Then, when the temperature differential reached 10ºC, the town was ordered evacuated. Hai-cheng was evacuated two hours before the major quake struck. During the month before the quake, a gas with an extraordinary smell appeared in the areas including Tantung and Liao-yang. This was termed “earth gas” by the people…one person fainted because of this….Many areas were covered with a peculiar fog (termed “earth gas fog” by the people) just prior to the quake. The height of the fog was only two to three meters. It was very dense, of white and black color, non-uniform, stratified, and also had a peculiar smell. It started to appear one to two hours before the quake, and was so dense that the stars were obscured by it. It dissipated rapidly after the quake. The area where this “earth gas fog” appeared was related to the fault area responsible for the earthquake. The careful monitoring of air quality and temperature saved many lives, due to a realization of the importance of gas in the causation of earthquakes. Summary. The causes of earthquakes as described in reading 270-35 are considerably more complicated than today's seismologists understand. The main causative force lies in Earth's internal movements such as thermal plumes, mantle motions, mountain building, subsiding sedimentary basins, and rocks undergoing folding. Secondarily, the causes lie in a confluence of planetary and stellar forces that act upon Earth. By a mechanism only dimly perceived if at all, these “outside forces” activate the “elementals” of our planet, the earth, air, fire, and water. To further complicate things, interactions between the elementals and the states of stress in Earth's crust act to influence the locations and magnitudes of the earthquakes produced. It seems that humankind has little chance accurately to forecast earthquakes and, indeed, all attempts to do so have failed. But the monitoring of known earthquake-source environments near population concentrations may provide generalized warnings of impending earthquakes – warnings sufficient to save the lives of those willing and able to heed them. Further considerations. Note now that reading 270-35 made the following additional predictions about specific earthquakes. If there are the greater activities in the Vesuvius [area?] or Pelee [area, or in Pele's realm on the island of Hawaii? ], then the southern coast of California —and the areas between Salt Lake and the southern portions of Nevada—may expect, within the three months following same, an inundation by the earthquakes. But these, as we find, are to be more in the southern than in the northern hemisphere. Let's examine only the primordial hydrocarbons hypothesis of volcanism and earthquake generation in trying to puzzle out what Cayce's source was talking about here. Speculations about which specific volcanoes were meant in the reading, or about the meaning of “an inundation by the earthquakes' is dealt with in “Signs of the Predicted Pole Shift and Earth Changes.” Our interest here is the connection between the eruptions, say, of Mt. Vesuvius (or Campi Flegri in the immediate area, and earthquakes some 6,000 miles away in the Wasatch Fault Zone of Utah. At the outset, I'm going to propose that volcanoes that suddenly begin to show “greater activities” are merely signaling greater releases of gases from upwelling primordial fluids. For reasons known only to Cayce's psychic sources, volcanoes like Vesuvius or Pelee, or those in their vicinities, are the best predictors of a renewed worldwide period of gas upwelling, and exit through crustal fractures or volcanic vents to the atmosphere. We know now that some gas releases may be responsible for earthquakes. So, once again, what's the commonality between a volcano signaling-event and the occurrence of earthquakes thousands of miles away? The commonality seems to lie in the relationship of Vesuvius or Pelee, and the earthquake belts of Idaho, Nevada, and southern California, to gas belts that are found in Earth's geologically young fault and fold belts. (See Figure 3). Indeed, the eruption of Pelee in 1902 exhibited flames, as did Krakatau in 1928. And that gas had occurred in the eruptions of Vesuvius seems evident by the observation of Seneca. He wrote that a flock of hundreds of sheep was killed in the Pompeian district during an earthquake some 16 years prior to the disaster of the eruption of Vesuvius that covered Pompeii with ash. 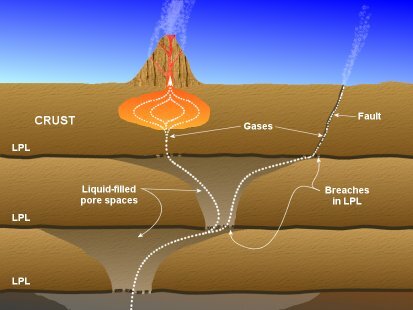 T. Gold provides an interesting analysis of the significance of mud volcanoes to his hypothesis of the role of gas flow in inducing earthquakes and volcanic eruptions. Locations of mud volcano fields are shown in Figure 3. All the evidence of eruptions shows that large quantities of some gases accumulate at depth and can blow with violence. This can occur either through vents that are created by the high pressure gas itself, or through vents that are held open by another fluid. These gases are frequently flammable. The sudden onset of [lava] volcanic eruptions can be understood best as due to a very rapid flow of gas through a freshly opened crack in solid rock, leading into a magma channel. Turning back to Figure 3, we note something provocative, if we dare call the fold-and-fault belts “gas belts.” These gas belts coincide with many of the locations mentioned in the Cayce readings as being ripe for Earth changes. In addition to those in America mentioned just above are Japan, the Mediterranean (including the Etna area), the Persian Gulf, South America from the uppermost portion to the end, many of the WWII battlefields, and in the Antarctic off of Tierra del Fuego. One can believe in Churchward's chronicling of gas belts from ancient texts, or in the modern scientific research of Gold and others. There is clear scientific evidence of the importance of primordial hydrocarbon fluids and/or their gases in producing Earth upheavals. These fluids and gases are two of the “elementals” that, at least according to reading 270-35, may be activated by cosmic forces to cause earthquakes and volcanic eruptions. Published by the Carnegie Institution of Washington, 1908, Washington D.C.
LaViolette, P., 1997, Earth under fire, Starlane Publ., Schenectady, NY, pp. 314-315. Gold, T., 1999, The deep hot biosphere,” Springer-Verlag, New York, 235 pp. Gold, T., 1987, Power from the Earth, J. M. Dent & Sons, London, 208 p.
See Griffith, J., 2002, James Churchward and his lost Pacific continent, World Explorer, pp. 16-25.